I put about 165,000 miles on a 1994 Dodge Caravan minivan that I bought new in December of 1993. I traded it in nearly ten years later for a used 2000 Jeep with 82,000 miles on it. I was nearly unable to drive the Caravan to the dealer that warm day in August ‘03 when I made the trade for my “new” Jeep. I had the driver’s side door wired shut, since a door hinge weld had pulled out of the surrounding metal; the electrical system was going on and off all the way there; and the engine was running very rough. But I made it into the dealer’s lot and got all of $400.00 for my minivan. He got the short end of the stick on that deal. Time is long past when I will buy a new car or lease one. They are much too expensive these days, and the value drops by at least one-third the minute you drive a new car off the showroom floor. 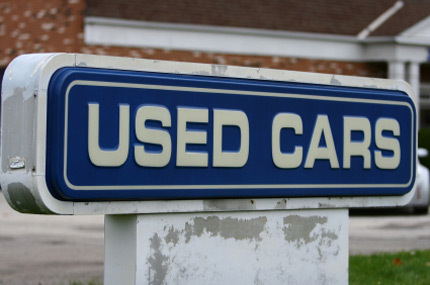 It makes so much more sense to buy a good used car with two or three years on it and as low mileage as you can get. Then pocket the difference. Let someone else take the initial hit on the vehicle, and then step in and get yourself a deal. Vanity (as in sporting a brand new car every couple of years) means nothing to me these days—except that I do make sure to shave in the morning. I have no one to impress at this point in my life, and wouldn’t be interested in impressing if I did. There are some things that we definitely learn as we grow older, proving that you can teach an old dog new tricks! Awww.. dad, you impress me every day!